During her time as a two-sport athlete and double major in psychology and biology, Olivia Krejcarek learned the value of being flexible. If she hadn't kept an open mind about attending a small college, she would have ended up at a large university as she'd originally planned. But one visit to St. Scholastica changed her view. "I just fell in love with everything this school is about," she said. "You could feel the sense of community. I realized how much I actually valued being a name, not a number." Continuing to be open to new experiences, she took some psychology classes and ended up pursuing a double major. "I liked it more than I expected I would," she said. "It completely switched my perspective around and made me question: ‘Do I want to go mental health or physical health?'" Believing that she could succeed in her academic career while also competing as a two-sport athlete helped Krejcarek thrive as well. 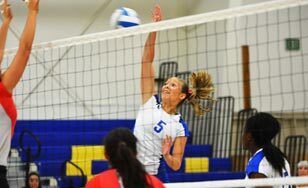 She was a two-year captain of the volleyball team and eight-time Academic All-Upper Midwest Athletic Conference honoree. She was twice named All-UMAC during the indoor track and field season as well as the outdoor season. During the 2015 season she was the outdoor conference champion in the pole vault. She also volunteered with the YMCA and Big Brothers/Big Sisters and served as a student representative on the College's Board of Trustees, all while maintaining a high GPA — she graduated in May 2015 with a 3.82. So what's her proudest accomplishment? "I think honestly it was just proving to myself that I could be a two-sport athlete and still do well in college," she said, "and make a lot of great friends, too." She's grateful for the support she received along the way from her teammates, professors and coaches. "All the coaches that I've had here have stressed the academic piece, which has been extremely helpful. I think even beyond that, it's putting what you have to do before what you want to do." Even when her to-do list was long, her day planner was full, and her Post-it note reminders were piling up, Krejcarek maintained a positive attitude. "I think if you enjoy what you do, it's never really work. That was the case for everything that I did at St. Scholastica." All those late nights spent studying after returning from long-distance away games didn't go unnoticed. Krejcarek recently won UMAC's most prestigious award, the Scholar-Athlete Leadership Award. She was also nominated for the NCAA Woman of the Year Award by UMAC. "It's a huge honor," she said. "It's nice that people notice that I worked hard." Still keeping busy — she's working as a medical scribe in the emergency room at St. Luke's Hospital in Duluth while coaching gymnastics at the YMCA. She's in the process of deciding whether to pursue medical school or clinical psychology… and she's keeping an open mind about the decision! Olivia loves St. Scholastica's sense of community. During the 2015-16 school year, we'll celebrate the Benedictine value of Community, and what it means to us.